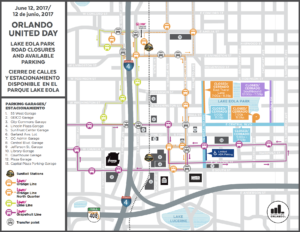 The City of Orlando and Orange County, in collaboration with Pulse, have designated June 12, 2017 as “Orlando United Day – A Day of Love and Kindness.” In conjunction with these events a number of road closures will occur. The City of Orlando encourages attendees to plan their travel and parking before going to any of the events. Travelers are encouraged to consider alternative modes of transportation including, LYMMO, bike share, car share and carpooling. Attendees can get the most up-to-date information on road closures and parking options at CityofOrlando.net/notice. Detour signs will be clearly posted before and along detour routes. 10 p.m. – 11:59 p.m.
7 a.m. – 11:59 p.m.
5 p.m. – 11:59 p.m. Parking at City garages will be available. On Sunday, June 11, and Monday, June 12, on-street/metered parking spots will be unavailable for general public on the south and east side of Lake Eola Park, this includes Rosalind Avenue and Central Boulevard. Limited ADA parking will be available on Rosalind Avenue between Jackson Street and Pine Street. Exit at Amelia Street (83A), take a right onto Amelia Street, then take a right onto Orange Avenue. Multiple City garages can be accessed on both the west and east side from Orange Avenue heading in this southbound direction. Exit at Colonial (84A), take a left onto Colonial, then a right onto Orange Avenue. Multiple City garages can be accessed from both the west and east side of Orange Avenue heading in this southbound direction. Alternatively, after exiting at Colonial (84A), proceed straight onto to Hughey. Multiple City garages can be accessed from both the west and east side of Hughey heading in this southbound direction. Take exit (10B) to I-4 East. Exit at Amelia Street (83A), take a right onto Amelia Street, then take a right onto Orange Avenue. Multiple City garages can be accessed on both the west and east side from Orange Avenue heading in this southbound direction. The following road closures will begin at 12:01 a.m. on June 12 and continue until 11:59 p.m. on June 12. 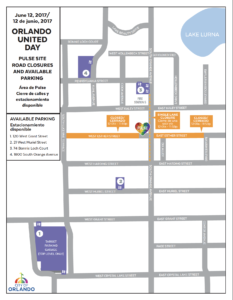 Due to limited public parking surrounding the Pulse Nightclub site, temporary parking locations have been identified for June 12 activities only. 120 West Grant Street – Parking garage behind Target. Visitors are asked to park on the top floor of the Target garage. There are two entrances, one from West Grant Street behind Target and the other from West Crystal Lake Street next to Target. 1800 South Orange Avenue – Surface lot next to Orlando Fire Station 5. There are two entrances, one from South Orange Avenue and the other from Pennsylvania Street. Exit at Kaley Street (81BC), take a right onto Kaley Street toward Orange Avenue. Multiple parking lots are available in the vicinity of Pulse Nightclub. Please refer to the map for exact locations. Exit at Michigan Street (81A), take a left onto Michigan Street, then a left onto Orange Avenue toward Kaley Street. Multiple parking lots are available in the vicinity of Pulse Nightclub. Please refer to the map for exact locations. Take exit (10B) to I-4 West. Exit at Michigan Street (81A), take a left onto Michigan Street, then a left onto Orange Avenue toward Kaley Street. Multiple parking lots are available in the vicinity of Pulse Nightclub. Please refer to the map for exact locations. For more information and updates on road closures, parking suggestions and recommended routes, please visit CityofOrlando.net/notice. The Central Florida Media Committee is assisting the City of Orlando, Orange County Government and event organizers with media and logistical support for events at Lake Eola and Pulse Nightclub on June 12. All media updates and logistics will be posted on cflmedia.org. Media interested in covering these events are required to apply for credentials ahead of time with the Central Florida Media Committee. Credentials issued for Pulse related events must be worn with a photo identification badge issued by the media outlet requesting credentials. Registration Deadline is May 26, 2017 at 6 PM ET. To register, go to: cflmedia.org. Media outlets may also request assigned parking, live locations and live truck parking through the Central Florida Media Committee at cflmedia.org. “Orlando Love: Remembering Our Angels” – Lake Eola Event on June 12 at 7:00 p.m.